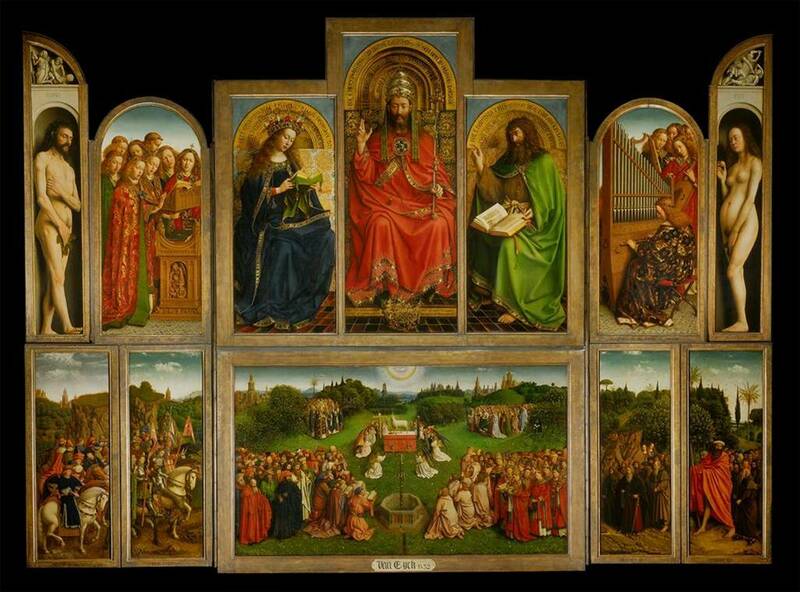 I’ve been looking at the Ghent Altarpiece this week. I love this one because it is so elaborate, so complicated, and so theologically rich—it summarizes the doctrine of salvation in a whopping 24 panels. I can’t possibly point out every amazing part of this artwork, but I’ll try to point out some sweet spots. When the wings are closed (the top image), the four lunettes at the top contain some prophets and sybils who foretold the coming of Christ. Directly below them, the angel Gabriel appears to Mary and tells her she will bear the son of God—in other words, the fulfillment of the prophecy. The bottom four panels are more perfunctory because they contain portraits of the two donors on the outside of two painted statues that could be their patron saints: John the Baptist (note the shaggy garment) and John of Revelation (note the cup of snakes). All of this is painted in relatively drab colors with a fair amount of empty—let’s say, pregnant—space. Lots of expectation here. When the altarpiece is opened, we see the end of the story. On the top level, you can see God (is it Jesus or God the Father? I vote the latter) enthroned and flanked by Mary and John the Baptist and a choir of angels. He is seated in majesty, supreme king and lord of all. If you follow the vertical axis from God Enthroned down, you can see a small dove (symbolizing the Holy Spirit) in a bright yellow-white light and then the Lamb on an altar (symbolizing Christ). The Trinity. The Godhead. Angels surround the altar, carrying symbols of Christ’s passion (the column and cross) and incense burners. This is the scene of the Adoration of the Mystic Lamb, as told by John in the book of Revelation. Crowds of saints and martyrs from biblical texts and from the whole of church history have gathered in the field to honor and adore the Lamb of God who has taken away the sins of the world. As a symbol of Christ’s sacrifice, the Lamb has a wound in its breast, and the blood pouring out collects in a chalice in a nod to the celebration of the Mass, the ritual that commemorates that sacrifice. First, the figures of Adam and Eve. I’ve always loved the fact that the van Eycks included Adam and Eve in this altarpiece. Their presence drives home the message of salvation—it was their original sin that necessitated the unfolding story of salvation—the story that was authored by the Godhead, prophesied by believers and pagans, and then accomplished when Jesus became the sacrificial Lamb. This work of salvation is received throughout history by the people of God and will be celebrated by all the saints in heaven forever more. Without Adam and Eve hovering ominously, we might not appreciate just how significant Christ’s sacrifice is. What’s all the fuss about? Well, we were all dead because of sin, but now we have eternal life. Big difference. Which brings us to the other important element: the fountain at the bottom. We know from the x-rays that the fountain was added later. Whether it was an afterthought or a part of the original design is unknown, but it is now an integral part of the message of the altarpiece. Without it, the painting is a neat and tidy doctrinal statement that I can give my intellectual assent to and move on. But with the fountain there, the painting speaks to me. The inscription on the fountain says, “This is the fountain of the water of life proceeding out of the throne of God.” It is flowing, to be sure, but what I find so amazing is the little spout that protrudes out of the base of the fountain and channels that water of life into a rough-cut ditch that leads directly down and seemingly out of the painting. The water flows out of the fountain to all who believe, including me, as I stand or sit or even kneel before this altarpiece. That little spout makes me a part of this grand narrative, or at least it invites me to participate. How do I respond?